[ Philip Saville, 'the Orson Welles of the small screen'. ] Two Autograph Notebooks by the pioneering British director: first with account of making of 'Hamlet in Elsinore', second with plot, dialogue, notes, for 'Stop The World, I Want To Get Off'. Both with Saville's London address, 28 Finchley Road, NW8. Both volumes undated, but the first around 1964, and the second around 1966. These two items date from the 1960s, a period during which Saville was a notable 'face' on the London scene: he dated the 'Avengers' actress Diana Rigg and the Pop artist Pauline Boty, and flew Bob Dylan to Britain for his first acting role. Clareville Lodge, South Kensington. 18 October 1901. 4pp., 16mo. In fair condition, lightly aged and worn. She lays before the recipient, apparently a newspaper man, 'a scheme which I intend to carry out very shortly', beginning: 'The works of British composers have as you know hitherto not received their fair share of attention at Pianoforte Recitals. [ Pauline Niven, wife of novelist Frederick Niven. ] Autograph Letter Signed to the poet Sylvia Lynd, discussing her husband's ill health, his work and other matters. 202B Victoria Street, Nelson, British Columbia, Canada. 23 September 1943. 8pp., 12mo. In good condition, on lightly-aged paper. 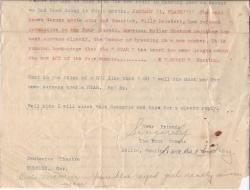 An interesting letter, written four months before the death of her husband. She begins: 'Dearest Sylvia - | I meant to write to you last month because I am one of those tiresome people who remember anniversaries & it was in August that you both came down to the Windermere to see us. 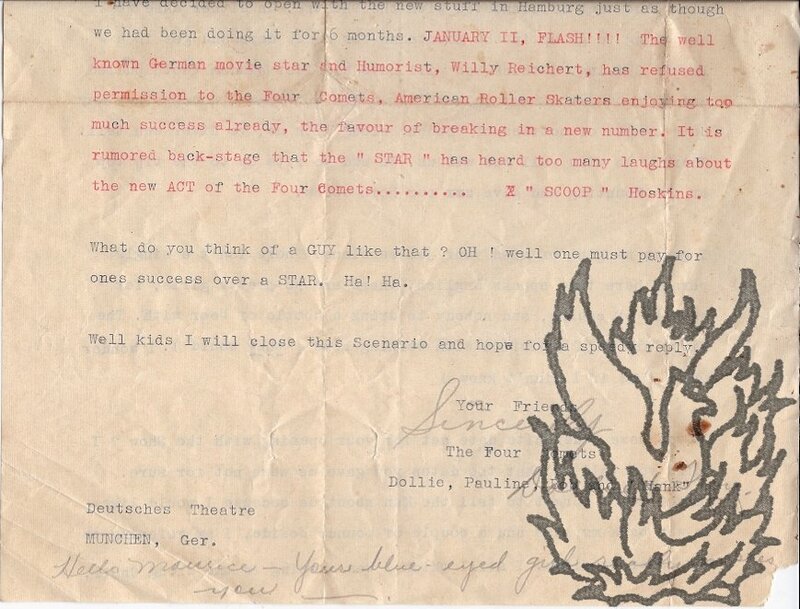 Typed Letter Signed by Troy and Dollie Hoskins for 'The Four Comets | Dollie, Pauline [Same], Bob [Saras] & "Hank" ' to 'Dear Friends' [the variety entertainers Bonar and Rubye Colleano], concerning an appearance in Austria with Willy Reichert. 10 January 1938; Munchen, Austria. 4to, 4 pp. 43 typed lines, and two-line manuscript postscript. Signed in pencil 'Sincerely | Dollie & Troy. ', with the name of the troupe typed over this. Text clear and complete on discoloured and creased paper. Chatty and humorous letter. 'By the time you read this letter we will have either left a terrible stench in the Theatre or else the Manager will be satisfied. [...] JANUARY 11, FLASH!!!! Autograph Letter Signed ('L. P. Hobart-Hampden') to 'Miss <Caste?>'. 21 May 1889; Fonthill Cottage. 12mo, 4 pp. Good. A bifolium, attached by a strip along the inner margin to a leaf removed from an autograph album, docketed 'Mrs. Hobart Hampden, Authoress of "The Changed Cross" '. Postscript written vertically across the upper part of the first page. Concerns a photograph of the recipient's mother: a 'sweet souvenir of such a rare & precious jewel as your dear & beautiful Mother; whom we feel it such a privelidge [sic] to see and to know'.